Both Casale and Holmes are 3-year varsity players. 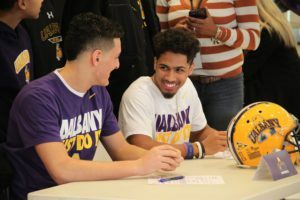 Both saw a tremendous career amassing a 35-1 career record and back-to-back New York State Public High School Association Class AA Championships in 2016 and 2017. Casale’s individual honors include the following titles: 2017 New York State High School Football Coaches Association Class AA Player of the Year; 2-time State Free Safety; 2-time NYS USA Today 1st Team Free Safety, 2-time Times Union Defensive Player of the Year; 2-time Section 2 Class AA First Team Free Safety and 2017 Class AA Defensive Player of the Year. 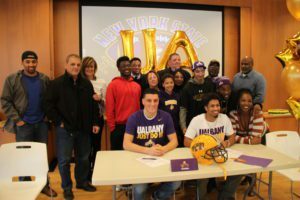 Holmes individual honors include: 2-time All State Wide Receiver; 2-time Times Union 1st Team Wide Receiver; 2-time Section 2 Class AA First Team and 2017 Class AA Player of the Year. Head Coach Bob Burns praised both athletes for their leadership and commitment to the team. 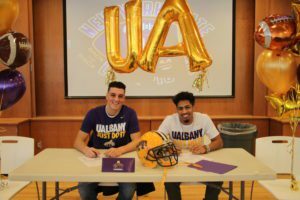 Troy City School District Athletic Director Paul Reinisch echoed that sentiment and said UAlbany is gaining two large talents. Joseph Casale is the son of Kathy and Mack Casale. Dev Holmes is the son of Jen and Chico Holmes.